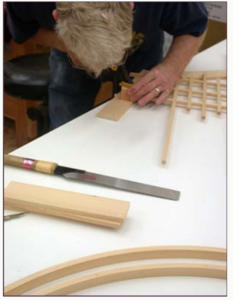 The Olympia Woodworkers Guild is an organization within Arbutus Folk School that has a mission focused on ‘developing a community of woodworkers‘. As a group, we meet monthly at the Arbutus woodshop facility. Our meetings consist of social time, announcements, show and tell of member projects, a program/speaker related to woodworking, and a question and answer time. We support Arbutus by informing members about upcoming classes being offered by the school. Our next meeting is Monday, March 25th, 2019. Doors open at 6:30 pm and the meeting starts at 7:00 pm. Our March meeting will feature local Shoji artisan Edward Crowell. This month offers another chance to provide a fine presentation. Our speaker for the meeting is Edward Crowell from Shoji Designs. Edward has been a wood craftsman for decades. He completed a boat building apprenticeship and was lead carpenter in a cabinet shop that specialized in yacht interiors. He is also accomplished in the fine art of guitar building. After years of fine woodworking experience, he opened his own shop specializing in high-end custom furniture. A longtime interest in Japanese art and antiques led to a focus on shoji screens, which are now the center of his shop’s creative focus. 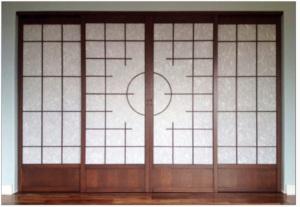 Shoji Designs Inc is a family run business and ships custom-crafted shoji screens in the continental United States as well as to Hawaii and Canada. Their website is www.shojidesigns.com. This promises to be a very informative presentation for the Guild. Downtown Olympia, next to Olympia Coffee Roasters and across the street from City Hall. Street parking is free after 5:00 pm. When: Monday, March 25th, 2019. Doors open at 6:30 pm. The meeting starts at 7:00 pm and ends around 9:00 pm. Also: Bring your show and tell items and any woodworking questions for the meeting. Again, always on the fourth Monday (evenings) unless otherwise noted. Please feel free to visit one of our meetings to find out more and decide whether you want to be a member! You can become a member online at this link. You can become a member of the Guild by joining here. Membership has many benefits, not the least of which is access to mentors who have significant woodworking knowledge. We encourage you to support the Guild by donating to Arbutus Folk School! For more information please email Bill Cogswell or call Bill at 360-584-7667. We also encourage you to visit the Guild Facebook page.